The 40-ton Godspeed was a fully rigged ship estimated to have been 68 feet (21 m) in length. As part of the original fleet to Virginia, leaving on December 20, 1606, she carried 39 passengers, all male, and 13 sailors. The route included a stop in the Canary Islands and Puerto Rico and, with better wind, would have taken about two months to traverse; instead, the voyage lasted 144 days. On June 22, 1607, Newport sailed back for London with Susan Constant and Godspeed carrying a load of supposedly precious minerals, leaving behind the 104 colonists and Discovery (to be used in exploring the area). 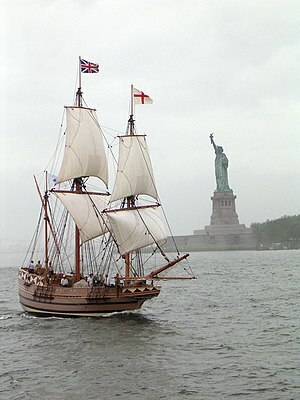 In 1985, a replica of Godspeed (rigged as a barque, only 48 feet on deck) sailed from London back to Virginia. She had a crew of 14 and stopped at many places that the original Godspeed visited including the Canary Islands and various places in the Windward Islands before sailing to Jamestown. The most recent replica was built at Rockport Marine in Rockport, Maine, and completed in early 2006. Its length over all is 88 feet (27 m), with the deck 65.5 feet (20.0 m) long, and the main mast 71.5 feet (21.8 m) tall, carrying 2,420 square feet (225 m2) of sail. Replicas of Godspeed and her sisters in the 1607 voyage, the larger Susan Constant and the smaller Discovery, are docked in the James River at Jamestown Settlement (formerly Jamestown Festival Park), adjacent to the Jamestown National Historic Site. Susan Constant, Godspeed, and Discovery, commemorated on the Virginia State Quarter. In May 2007, the United States Postal Service issued the first 41 cent denomination first class stamp. The stamp had an image of Susan Constant, Godspeed, and Discovery. 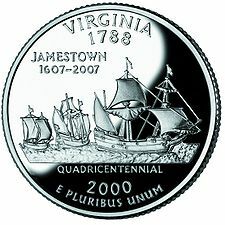 Godspeed was also depicted on Virginia's coin of the 50 State Quarters, in celebration of the quadricentennial of Jamestown. ^ "History of the British Flag". United States National Park Service. Retrieved 2 October 2016. Price, David A. Love and Hate in Jamestown. Alfred A. Knopf (2003). Chapter 3.
http://www.qsl.net/wa4chq/godspeed.html for more information about the 1985 Voyage of Godspeed. http://rockportmarine.com/godspeed-2/ for more information about the construction of the replica of Godspeed. This page was last edited on 25 February 2018, at 00:16 (UTC).